Can you believe it? We are exactly two months away from the release of our first cookbook! On Tuesday, March 12, the Husbands That Cook book will be available everywhere, and today we’re throwing a party. We’re excited to announce that EVERYONE who preorders the book will receive two brand new, never-before-seen Husbands That Cook recipes that don’t appear in the book or on the blog! To receive this bonus gift, simply email a screenshot of your proof of purchase to us at husbandsthatcook at gmail dot com, and we will send you an exclusive ebook as a personal thank you! This promotion is open to everyone no matter where you live, and we can’t wait to show you what we’ve been cooking up behind the scenes! The holidays are near and the Husbands are here with some chocolaty cheer on this rainy Wednesday in Eagle Rock. We are celebrating a few things today: the first is this rare, gloomy weather where we plan to stay indoors and write this post in our warm robes, sipping gingerbread hot chocolate and enjoying the sound of rain falling outside. We’re also popping the champagne because we just received our first cookbook review from the respected Publishers Weekly! 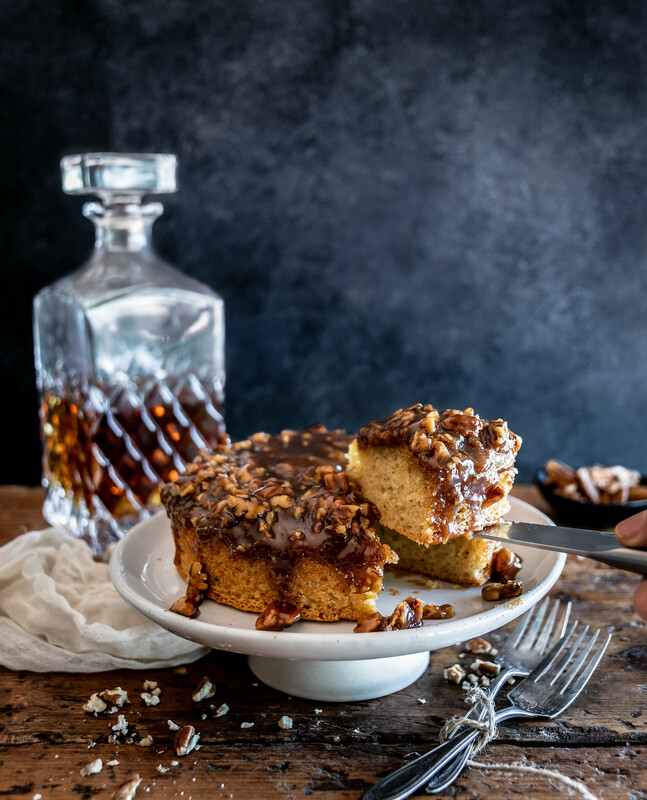 If you would like a little teaser of a few recipes included in our book, they highlighted a handful of them in the article, which you can read here. 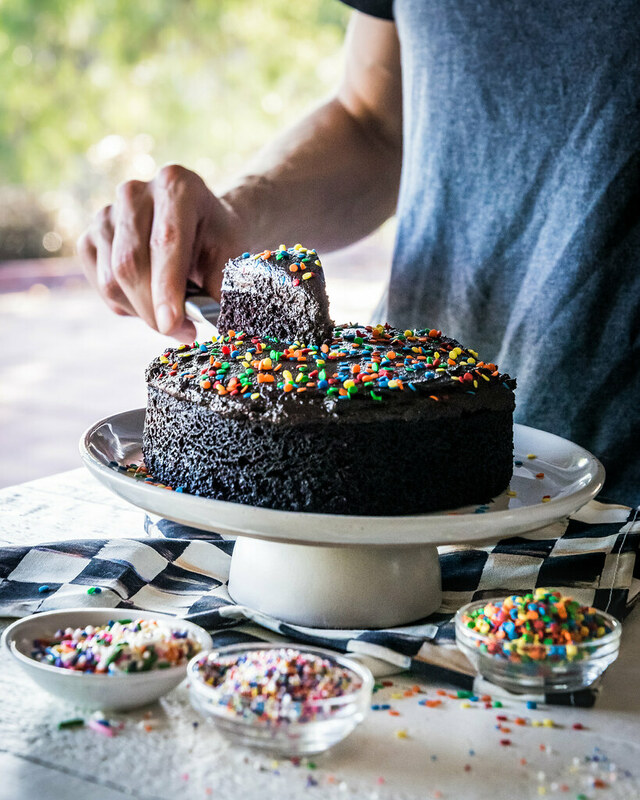 Aaand, we are also celebrating by giving you a sneak peak into the dessert chapter of our upcoming cookbook! 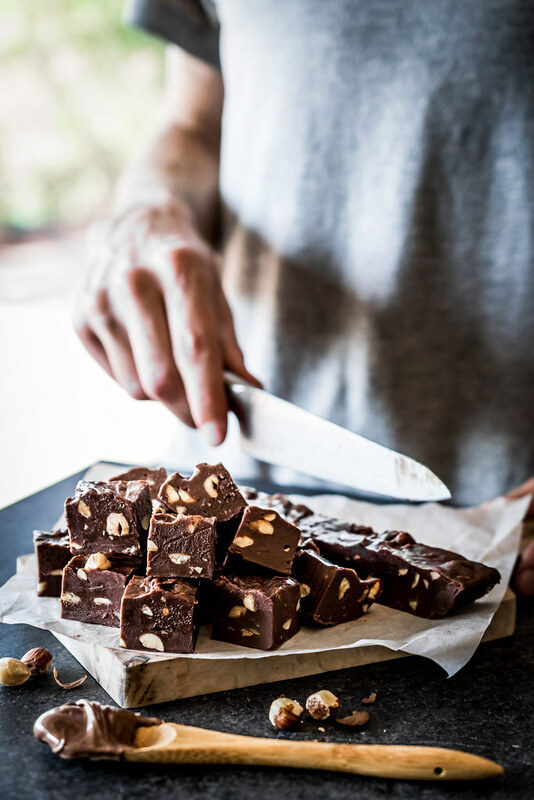 For all you Nutella fans out there, your holiday dreams have come true with this easy-to-make toasted hazelnut fudge. If you’re still looking for present ideas this season, these rich, creamy squares are just begging to be wrapped into festive gift bags for all your friends and family. Preheat oven to 350°F/177°C. 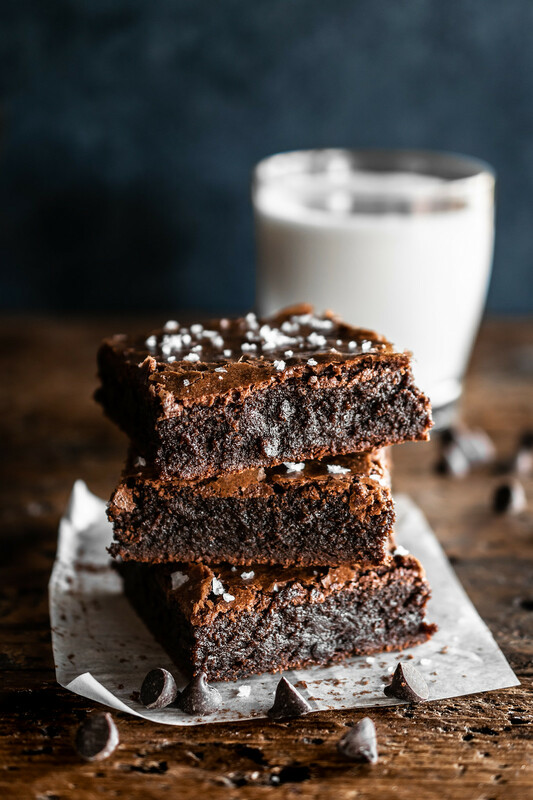 Line the bottom and sides of an 8-inch square baking pan with parchment paper or aluminum foil, leaving some overhang to lift out the brownies later. Place a medium saucepan on the stove with a few inches of water, and place over medium heat until simmering. In a heatproof mixing bowl, stir together the butter and chocolate chips. Place the bowl on top of the pan of simmering water, and stir until the mixture is melted and completely smooth, about 5 minutes. Remove the bowl from the pan and let cool briefly. Then add the sugar, flour, baking powder, and salt, and stir to combine. Add the eggs and vanilla, and stir until smooth and blended. Pour the batter into the prepared baking pan and smooth the top into an even layer. Bake for 40 to 45 minutes, until a toothpick inserted into the center of the brownies comes out with a few crumbs attached. Sprinkle the brownies with several generous pinches of flaky sea salt, and let cool completely in the pan, about 1 hour. Use the parchment paper to lift the brownies onto a cutting board, and slice into your desired number of servings. Enjoy! We’re baaack! You may have noticed the last recipe we posted on our blog was in January, but let us assure you that we have been working on something very special behind the scenes, and will be sharing some exciting news later this month. Stay tuned—and until then, we have a sweet treat for all your Cinco de Mayo entertaining needs. 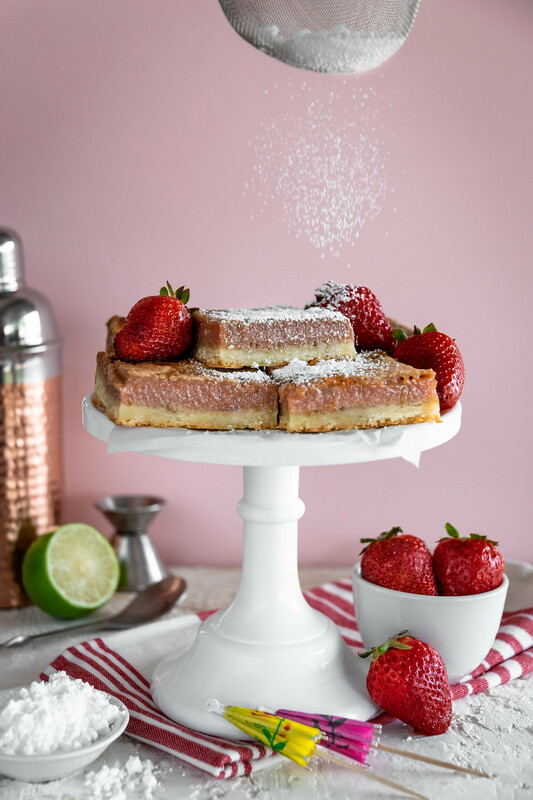 Imagine a lemon bar—but instead, the lemon is replaced with a tangy strawberry-rhubarb filling made with fresh lime zest and a hint of tequila! Celebrate this festive holiday with spicy tacos, cool margaritas, and an irresistible margarita-inspired dessert that will have everyone cheering Olé! This pretty pink recipe is our contribution to #MargaritaWeek, hosted by Kate Ramos of Hola Jalapeño. Click HERE to see all the other bloggers’ creative recipes, and we’ll see you at the fiesta! Preheat the oven to 350°F/177°C. Line an 8-inch square baking pan with two overlapping sheets of parchment, with the paper overhanging the sides, creating a sling to lift the bars out later. Set aside. Place the strawberries and rhubarb in a food processor or blender, and purée until smooth and liquified. Strain the mixture through a nut-milk bag, several layers of cheesecloth, or an ultra-fine-mesh strainer to remove all seeds and pulp. You should have about 2 cups of juice. Pour the juice in a small saucepan and add the tequila. Set the pan over medium-low heat, bring to a gentle simmer, and cook until the liquid reduces to just 1/3 cup of thick syrup, stirring occasionally, about 45 to 55 minutes. If the mixture begins to foam up, lower the heat to a more gentle simmer. When the mixture has reduced to 1/3 cup, pour it into a heatproof measuring cup and chill in the fridge for 10-15 minutes before use. Meanwhile, as the juice mixture is simmering, make the crust: in a mixing bowl, beat the butter until light and creamy. Add the granulated sugar, powdered sugar, lime zest, salt, and pepper, and beat until fluffy and smooth. Add the flour and beat until just combined. Transfer the dough to the prepared baking pan and use your fingers to press it into an even layer over the bottom of the pan, about 1/4 inch thick. Bake for 15-18 minutes, until the edges just begin to turn brown. Remove from the oven and allow to cool briefly. 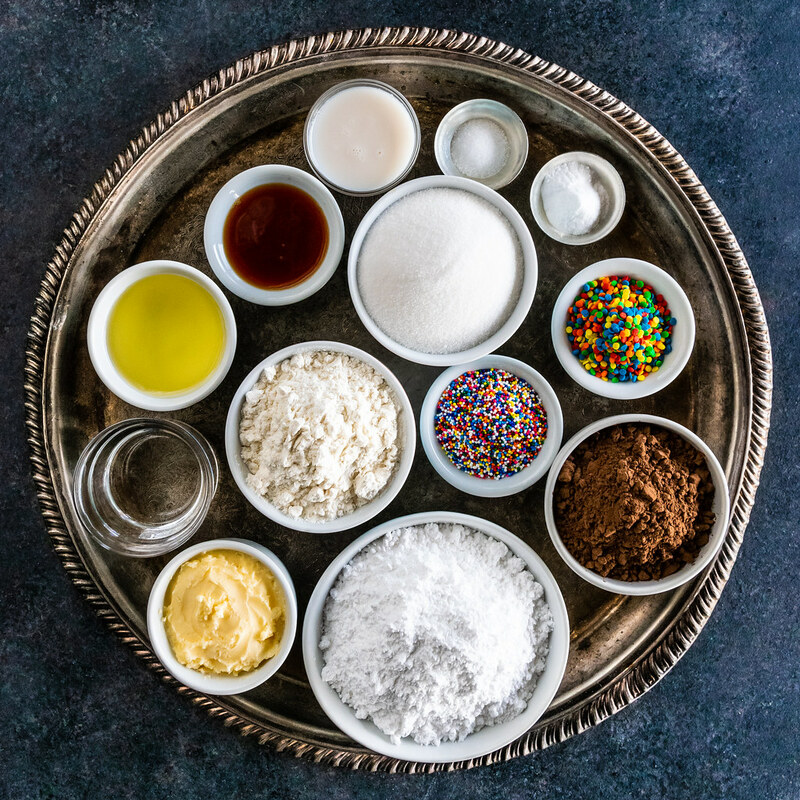 While the crust is cooling, finish making the filling: in a mixing bowl, whisk together the eggs, granulated sugar, and powdered sugar until smooth. Add the cooled juice mixture, flour, and lime zest, and whisk to combine. Pour over the warm crust and bake until the center is set and the edges begin to brown, 25 to 30 minutes. Place the pan on a cooling rack and cool completely. Then cover the pan with foil or plastic wrap, and refrigerate until chilled, at least 2 hours or overnight. Cut into squares—either 9 large squares or 16 smaller ones—then dust with additional powdered sugar and enjoy!